If you posed this question to your clients, they might think you were a little strange, but it’s a question that coincides with this month’s theme for National Nutrition Month® (NNM): “Put Your Best Fork Forward.” It’s a theme that encourages people to change their eating habits by making small changes one forkful at a time. 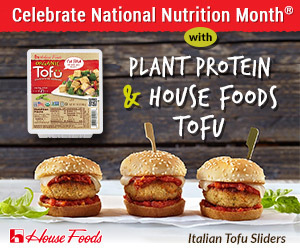 In this month’s E-news exclusive, Today’s Dietitian interviews some RDs from across the country to find out what activities they’re participating in for NNM to help promote healthful eating in their communities, encourage shoppers to make permanent lifestyle changes, and what they hope to accomplish this year. After reading the article, visit Today’s Dietitian’s (TD) website at www.TodaysDietitian.com to read the digital edition of the March issue, which includes articles on strategies for counseling athletes, Kroger’s The Little Clinic, understanding your role in end-of-life care, and our annual profile of our TD10 winners who are doing amazing work in the nutrition profession. In conjunction with National Nutrition Month®, supermarkets are emphasizing that every forkful can make a difference. Every year, National Nutrition Month® (NNM), a nutrition education campaign sponsored by the Academy of Nutrition and Dietetics (the Academy), provides an exciting platform for dietitians to get consumers more engaged in the nutritional food choices they make on a daily basis. Supermarket dietitians across the country are participating in food demos, recipe sharing, and other ideas in keeping with this year’s “Put Your Best Fork Forward” theme. According to the Academy, the NNM 2017 theme is a reminder that every individual “holds the tools to make healthier food choices,” and that making small changes can make a huge difference now and into the future. In this article, Today’s Dietitian speaks with three different supermarket chains to find out what they have planned for shoppers and associates throughout March. Despite a 2011 pledge among US chain restaurants to improve the nutritional value of children’s menu options, a new study finds no significant improvements have been made to cut calories, saturated fats, or sodium. The study is the first to look at trends in the nutrient content of kids’ meals among national restaurant chains since the National Restaurant Association launched the voluntary Kids LiveWell program in 2011. The study is published in the American Journal of Preventive Medicine. By 2015, more than 150 chain restaurants with more than 42,000 locations had joined the Kids LiveWell program and pledged to increase the number of nutritious menu items available to children. In the years since, several major chain restaurants have announced that they will remove soda as the default choice on children’s menus, while others have added healthful side options such as yogurt and fruit to kids’ menus and meals. The authors, led by researchers at the Harvard T.H. Chan School of Public Health, say that while these steps have the potential to make a difference, the results of the study show more meaningful changes are needed. ScienceDaily outlines a study in which hair samples show that people who suffer from long-term stress may be more prone to obesity. Consuming whole instead of refined grains improves gut microbiota, which can impact immune and inflammatory response, according to Los Angeles Daily News. Learn about intensive behavioral therapy for weight management in this month’s issue of Today’s Dietitian. Read the CPE Monthly article, take the 10-question online test at CE.TodaysDietitian.com, and earn two CEUs! 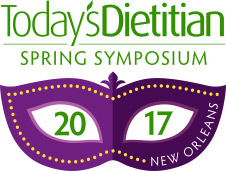 If you're a dietitian who loves learning about your chosen field, needs CEUs, enjoys meeting and networking with other RDs, and wants to visit one of America’s most colorful destinations, then you should plan to join us at the 2017 Spring Symposium in New Orleans May 21 to 24. Alongside fellow nutrition professionals, you can earn up to 20 CEUs in our sessions and workshops, which will be presented by some of the leading voices in dietetics. Registration is close to full capacity—REGISTER NOW! Registration does not include accommodations or travel to and from New Orleans. Coming up in our April issue is our Spring Product Showcase. Email a sales representative to be part of this unique advertising opportunity.